This large collection consists of numerous photographs and correspondence related to the extended Mast family of Watauga County, North Carolina. Series 1 consists of several hundred photos depicting various members of the Mast family and related families. Many of the images are studio portraiture, while others are snapshots taken at various locations throughout the world. 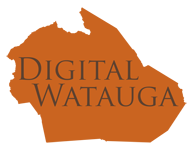 Because of the complexity of this series and various issues related to the condition of the images, they will be added in stages to the Digital Watauga Project website. A detailed finding aid will be forthcoming when the collection is completed. James B. Mast, Jr., of Clemmons, NC, has generously agreed to share these images with Digital Watauga through a digital use rights deed of gift. Any reprinting, redistribution, or other use of these images outside of Digital Watauga requires written permission from James B. Mast, Jr. Contact Digital Watauga for additional details.